Good news here as a call to Matt Albert at Yachting Partners International confirms that he acted for the seller in the sale of the 37m Heesen motor yacht Hayken (ex Seascape) with Wes Sanford at Northrop & Johnson representing the buyer. Built in 2005, this ABS-classed flybridge motor yacht cruises at 26 knots with a maximum speed of 32 knots. 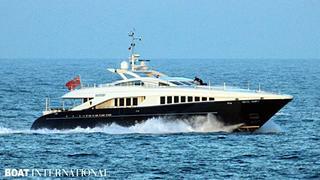 She accommodates 10 guests in an on-deck master suite plus two double and two twin cabins below. Both Matt Albert and Wes Sanford say she wasn't even on the market so I can't give you her asking price regrettably.